This web site uses the most advanced and secure online software technology available today, guaranteed to create a perfect, high-quality, lawyer-approved legal Will, custom-made to your personal situation and local jurisdiction. We are so confident in our proven technology, which has taken over 5 years to develop, and is updated continuously, that we offer a 30-day 100% money back guarantee if you are not completely satisfied with your Will. 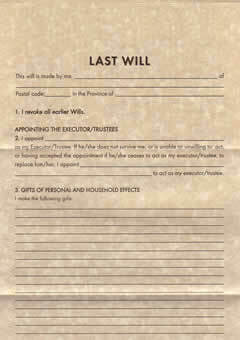 How is the ExpatLegalWills.com MyWill™ service better than a do-it-yourself legal will kit? The Keyholder® Advantage. Where do you plan on storing your Will? Can the "Executor" of your Will easily locate all of your assets? When you pass away, let us worry about communicating the location of your Will and a list of your assets. 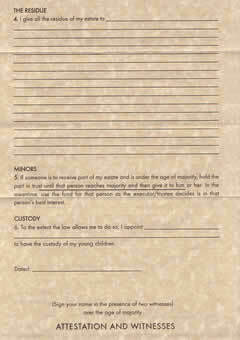 This optional service is provided for FREE when you create a Will here at ExpatLegalWills.com. There is simply no other company that provides such a complete and convenient service to their customers. Tell me more. Most people do not need a lawyer, but be careful. It is extremely important for everybody to have a legal Will. However, the whole process of expressing one's estate planning wishes has in many cases been made overly complicated by the legal profession. There is no doubt that people with large estates, sophisticated business interests, or unusual family situations, should seek legal advice. But for the vast majority of people it is possible to legally document one's wishes, without paying exorbitant rates for legal advice. Many publishers have attempted to address this need by heavily marketing "do-it-yourself legal will kits" which have been easy to condemn by the legal profession because, for the most part, they are awful. Here, we explain what makes legal will kits so poor, and how the MyWill™ service at ExpatLegalWills.com differs. Most do-it-yourself will kits are too simple. At ExpatLegalWills.com we have investigated and reviewed a number of "do-it-yourself legal will kits" and share the conclusions already made by the CBC in their Market Place consumer affairs show that for the most part, they are grossly inadequate and can lead to drawn out court battles where family members try to interpret the statements of the testator. In an article published in the Miami Herald in 2002, Peter Cohen, a Miami lawyer, said: "I really believe that tremendous damage is being done with these kits. If they go wrong, the consequence are grave.''. The key finding of these investigations has been that most kits are just too simple, and, as a leading Canadian lawyer noted, "What is not in here is more important than what is in here". You must plan for the unexpected. As lawyers tend to point out, what is missing in these simple will kits is a description of what can go wrong. What happens if John Doe has two children? Or a wife? What will happen if James Doe dies before John Doe? Contrary to popular belief, you are not necessarily free to leave your estate to whoever you please. 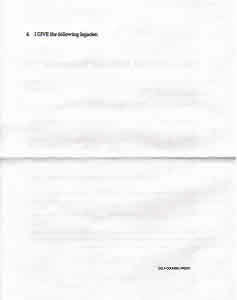 So a blank piece of paper may be called a "legal will kit" but the completed document may have no standing in a court of law. What happens if you have any dependents currently in your care? If you provide for them today and they have an established relationship with you, then they may have a claim on your estate (depending on local laws). What if you have any debts that you owe or have anything owed to you? What if you want to make a more detailed provision for each of your beneficiaries not being able to receive a particular part of your property. For example, if one beneficiary does not survive you, you may want to name an alternate beneficiary. What will happen if both parents are killed in the same accident? What if you are not absolutely explicit in your wording? Terms like "divide my estate equally between my cousins and my friend Bill" have at least five different interpretations. The MyWill™ service has been designed to handle all of these issues. Using an informative and comprehensive system such as the MyWill™ service at ExpatLegalWills.com makes more sense. It is not perfect for every situation, and you can check our Frequently Asked Questions to determine if MyWill™ is suitable for you. If it is, then you will benefit from stepping through a series of questions ranging from your family status, your wishes for estate distribution, setting up alternate plans, specifying guardianships and trusts, and setting up charitable donations. We will then build your responses into a legal will custom-made for your local jurisdiction and based on templates created from legal reference books (the type that are found on the bookshelves of every estate planning lawyer). Incredible value for money. Our membership pricing model allows us to provide you with the most value for your money at prices that are unprecedented in the legal industry. We worked with lawyers to bring you this service, and we paid for their legal services so you don't have to. If you wish, we can inform you by email about any changes in legislation which may have occurred in your jurisdiction that may require changes to your Will. Or we can send you simple email reminders, no more than once a year, to remind you to consider updating your Will if any significant changes have occurred in your life. Our wizards, help and information are designed to be the best on the market and are kept up-to-date on an ongoing basis. The MyWill™ service provides you with complete instructions and answers your questions in everyday language, free of legal industry jargon. We have developed this service based on the requirements of the public, not dictated by the legal profession. The Keyholder® Advantage. You can take advantage of our unique messaging service which allows you to describe the exact location of your Will and to provide a detailed list of assets for your Executor. All for no extra charge. When you pass away, let us worry about communicating this information to the people you specify. There is simply no other company that provides such a complete and convenient service to their customers. For more information, read about The Keyholder® Advantage. We have a strong focus on protecting the privacy and security of your information. We use industry standard encryption algorithms for storing all of your private information, and the design of ExpatLegalWills.com ensures that the contents of your Will are made available to the specific people designated by yourself, and only at the appropriate time. You can even have your final document checked over for consistency and completeness by one of the affiliates in our legal team. Don't take our word for it. Try it out for yourself. We have worked with lawyers in Canada, the United States and the United Kingdom to bring you the MyWill™ service and to ensure that it is of the highest quality. Best of all, you can try it now, without any commitment. 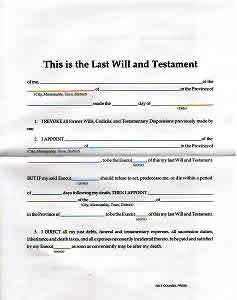 Take a look at the sample will kits described on this page, then try the ExpatLegalWills.com MyWill™ service. Then decide.